“What if you did nothing for twenty-four hours?” said my friend Marla as I related to her an incident that had me close to coming undone. Her calm advice couldn’t have been more foreign to me at that moment. I was in a leadership role that I believed compelled me to act. To address. To solve. To direct. What was this ‘stand down’ approach? Could it possibly work? What seemed like madness at that moment morphed into advice that has stood the test of time. The Marla ‘holding pattern’ allowed me to experience a few new things. First, the incident’s profile changed radically within twenty-four hours; in that short period positive alternatives emerged that wouldn’t have seen the light of day had I swooped in immediately. Second, most of it went away. Only the core key issue remained one day hence. Have you ever jumped into something only to realize that you’ve spun things up unnecessarily? My Marla moment roared into my frontal lobe about a month ago while I was attending office hours for entrepreneurs sponsored by a dynamic group of female leaders in Boston. I am a newbie with the group so I was paired up with another veteran. She and I were coaching an entrepreneur who had a truly outstanding business idea. The idea was still in its concept phase. From my perspective, the entrepreneur’s most valuable next step was to validate the concept. Will someone buy it? What conditions are required for the concept’s success? Little else is of value until these questions can be answered…. Given my bias….I offered that ‘sprinting’ to validation would be the best course of action. I was truly dumbfounded by some of the advice offered by my peer. She directed this women to spend time developing other potential sources of capital, both debt and equity. From my perspective, these actions would be a true waste of time given the stage of the business. So there it is. Great advice compelling me not to act. And mediocre advice compelling another woman to act. How do you know when to act even if the best action is no action at all? In my transition many (many, many…) people have offered advice. The great majority of it was decent. Some exceptional. And some a complete waste of time. Shannon Breuer, in Novofemina’s Voices of Transition: Choices & Learning, offered “transition has parallel paths; researching and soul-searching.” I like her buckets. Much of the advice I’ve gotten via networking during my transition can be categorized as researching. The soul-searching bucket has been more non-linear with its own important gates and milestones. For the record, I don’t often dignify these gates or milestones. My guess is that I’m not alone…. Here is the intersection for me: I’ve been more confident about when to ‘act’ on info gotten in researching as I’ve cleared gates on the soul-searching side. Think side-by-side swim lanes. Are you making progress in both? Do you favor one or the other? Novofemina turns “1” next week. 52 posts. It took many months before I trusted myself enough to act. I am so thrilled to have taken this step. I love the topic of women’s transitions and believe that there is much more to it than I’ve been able to address in a year. I believe very strongly that women’s transitions are a consistent part of the arc of our lives; they are less event-driven than those experienced by our male peers. We as a society don’t acknowledge this as much as we could which puts at risk many women who disengage as various twists and turns along the arc’s course. For my anniversary post I’ve committed to myself to write about what I’ve learned in the last year. We’ll see next week if I’ve made any progress. If you have some transition learnings that you’d like to share please comment or, for those camera-shy among us, send me an email at the address on the About page. I’m different for having acted to create Novofemina…it is a wonderful part of who I am…I think it was there long before I actually began. Here is a simple test…I smile every time I talk about it. Is it your time to act? 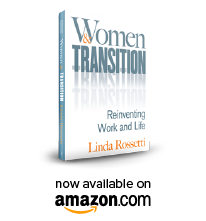 This entry was posted in Observations on Transition and tagged career transition, career transition issues, linda rossetti, novofemina, observations from a women's transition, Professor James Cash, transition, women's professional transition, women's transition issues. Bookmark the permalink.